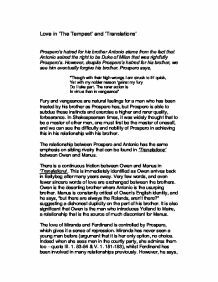 Love in 'The Tempest' and 'Translations' Prospero's hatred for his brother Antonio stems from the fact that Antonio seized the right to be Duke of Milan that was rightfully Prospero's. However, despite Prospero's hatred for his brother, we see him eventually forgive his brother. Prospero says, "Though with their high wrongs I am struck to th' quick, Yet with my nobler reason 'gainst my fury Do I take part. The rarer action is In virtue than in vengeance" Fury and vengeance are natural feelings for a man who has been treated by his brother as Prospero has, but Prospero is able to subdue these instincts and exercise a higher and rarer quality, forbearance. In Shakespearean times, it was widely thought that to be a master of other men, one must first be the master of oneself, and we can see the difficulty and nobility of Prospero in achieving this in his relationship with his brother. 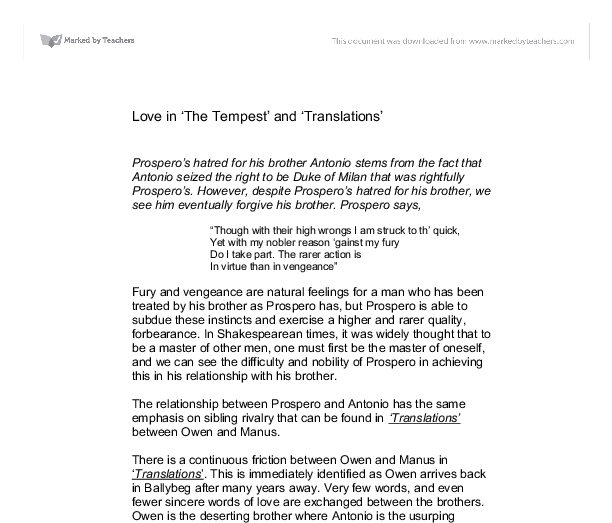 The relationship between Prospero and Antonio has the same emphasis on sibling rivalry that can be found in 'Translations' between Owen and Manus. ...read more. But you, O you, So perfect and so peerless, are created Of every creature's best" They identify the royalty in each other. They can also be seen as a symbol of unity, as they join Prospero and Antonio, causing them to recognise the value in amicability. In 'The Tempest', language creates a freedom of expression between the lovers. However, Prospero feels it necessary to be in control to love someone. He must be manipulative. 'The Tempest' demonstrates that relationships do not rely on power but in the bond of mutuality made possible by language. However, in 'Translations', language is the very restriction felt by Yolland and Maire. Their love is constrained due to language. 'Translations' shows that often speaking the same language is not a guarantee of love, as is highlighted by the phrase, "but will that help you to interpret between privacies?" ANALYSE TWO TEXTS - MAIRE AND YOLLAND DRIFTING APART DUE TO LANGUAGE AND FERDINAND AND MIRANDA COMING TOGETHER DUE TO LANGUAGE. Language cannot express the love that they feel for one another, so they turn to cosmic means, calling the basic elements. ...read more. However, all of these names stress the same opening word - "My", which identifies Prospero as a commanding authority. When Ariel has moods of reluctance, and reminds Prospero that their relationship is based on a bargain ("Remember I have done thee worthy service...Thou did promise to bate me a full year"), Prospero feels the need to re-establish his superior position, as he replies, "If thou more murmur'st, I will rend an oak, And peg thee in his knotty entrails, till Thou hast howled away twelve winters" Ariel, although unable to feel human feelings and emotions, is intrigued to know whether his master loves him, and he eventually asks him, "Do you love me master? No?" Indeed Prospero loves Ariel more than any other character in the play. The relationship between Lancey and Owen in 'Translations' is very different. Lancey and Owen seem on friendly terms at first glance, but at the end of the play, Owen is instructed harshly by Lancey, saying, "Do your job. Translate." A similarity can be seen between the reinforcement of a hierarchy by Lancey and by Prospero, but Lancey does not love Owen. Owen is simply a means to an end, a relationship purely built on the grounds of business. ...read more. is after Ariel and Prospero have spoken, and it is Miranda's turn to awake: "Awake, dear heart, awake; thou has slept Well." The words "dear heart" express the caring feeling towards Miranda, and also shows us what Miranda possesses. We next meet Caliban who was the native of the island before Prospero and Miranda arrived. what she still does, and it shows a reverse in authority when she sneaks out to be with Ferdinand. Although she may think she has the upper hand Prospero is all too aware of his daughter's escapades behind his back, which shows his power on the island of knowing absolutely everything that is happening and where. The structure of the play during the storm is of course created by Ariel's strong magic. This shows that Ariel is powerful enough to transform natural weather. Another transformation that happens in the play is at the end when Prospero declares he will give up his 'art'. I want her to completely change her voice to make it sound seducing and smooth, to show how she deceives those around her. Even the way Lady Macbeth speaks is of great control, for she talks in blank verse, iambic pentameter. When Prospero frees Ariel from the tree this seems to be a very heroic deed, however, although this seems like a heroic deed it appears that Ariel has become Prospero's servant or even slave. Although Ariel is a very willing servant, Ariel is a servant to Prospero nether the less. He says, "I pray thee, mark me" and "Dost thou hear?" But Prospero does not communicate well and sometimes talks nonsense so that it is hard to understand what he means. Prospero explains that he gradually grew uninterested in ruling his kingdom and turned his attention more and more to his studies and books, neglecting his duties as duke. this willing illusion, -yet they do not on that account cease to be ends themselves; and we must remember that, as such, they carry their own justification with them, as long as they do not contravene or interrupt the total illusion. Caliban is the rightful owner of the Island as he inherited it from his mother, the black witch Sycorax. She is described as a : 'foul witch' 'blue-ey'd hag' His father was the devil : 'got by the devil himself ' All these facts indicate that Caliban is venomous and not a creature to be liked.